In this guide you’ll learn how you can watch Rangers TV from the UK as if you were abroad and stream any of the live Rangers matches on the service. Rangers TV is the excellent online Football streaming service offered on the Rangers website. If you’re a Rangers fan outside the UK, either an expat, on holiday or perhaps just a Rangers fan not even from Scotland then you can watch the majority of matches for just £4.99 or US$7.50. If however you’re a Rangers fan living in Scotland or the rest of the UK then you’re blocked from using the service which is pretty disappointing because often there’s no alternative for watching. In this guide we’ve got a simple solution and in just 6-steps you can watch Rangers TV from within the UK without any issues. You can sign-up for the Rangers TV website no matter where you are in the world but if you try and login and stream matches from within the UK you’re blocked from viewing. To unblock this you need to download an app called a VPN from a provider such as my recommended one ExpressVPN. This allows you to change your online location. This means you can pretend to be in another country where Rangers TV isn’t blocked and stream the matches in the Scotland and across the UK. VPN services cost a few pounds per month and they work out cheaper if you subscribe for a year. If fact you can save 49% off the regular ExpressVPN price when taking their annual package. If you can’t get it working then no need to panic, ExpressVPN have a 30-day money back guarantee covering you. Just follow the instructions below to get a VPN and to use it to watch Rangers TV in the UK. Go to the Products section of their website and download the correct app for your phone, tablet or computer. Once you’ve installed the app, run it and then login with the account details you created. Press Choose Location and select the Netherlands. Once the app has connected visit the Rangers TV website and login. You’re now free to buy and stream any of the Rangers matches. When you’ve finished watching you can simply Disconnect from the ExpressVPN app which is in the same location the Connect button was. You can reconnect as many times as you wish and as much as you wish so you can watch further matches in the future. If you’re still struggling to connect take a look how easy it is to connect on ExpressVPN. Below the screenshot shows us connecting to the Netherlands on a Windows PC but the process is exactly the same on mobile devices, tablets and Mac computers. Once you’ve pressed Connect it’ll take between 15 and 20 seconds for the app to connect. As soon as it’s connected any website you visit will think you’re in the Netherlands. You can now visit the Rangers TV website and watch any of the matches in the UK as if you were outside the UK. 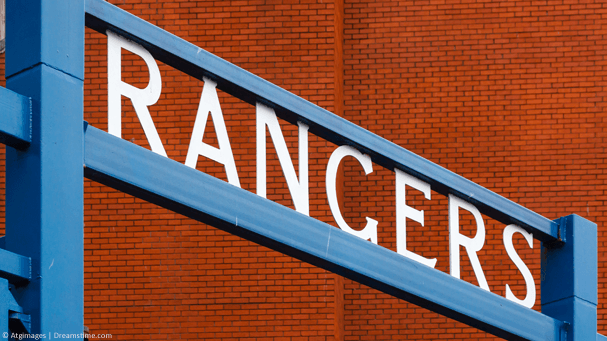 Rangers TV is the online streaming services for Glasgow Rangers Football Club. They offer live streams of most of their football matches to users from outside the UK. Each match can be paid for on its own so you only need to pay for matches you want to see and not ones you don’t want to see. Unfortunately Rangers TV live streams are not available to UK residents so although you can pay for them, you can’t actually watch them. A VPN from ExpressVPN as described above allows you to unblock these streams and watch all the Rangers TV matches in the UK. 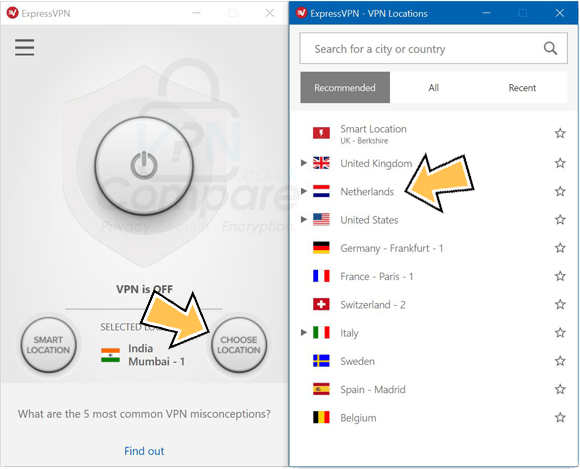 ExpressVPN isn’t the only VPN service, in fact there are more than 1000 different companies that offer VPN services these days. Not all are suitable for watching Rangers TV though because they’re just too slow for streaming video. We tested ExpressVPN and found them to offer the best combination of speed and price meaning you won’t suffer any buffering when watching Rangers. All you need to do is click on their name and follow the same instructions as for ExpressVPN above. We don’t recommend “Free” VPN services because they can put both your privacy and data in danger. They’re also incredibly slow because thousands of people are cramming onto them. It can often result in buffering and laggy streams and you don’t want it to freeze just as Rangers are about to score! If you want to know a bit more about the dangers of “free” VPN services take a look here, here and here. To watch Rangers TV in the UK you’ll need to get yourself a VPN service. We recommend ExpressVPN which you can get by clicking the button below. They’re easy to use and offer fast speeds which is great for streaming live video. They’ve also got the risk-free 30-day money back guarantee. If you can’t get it working just get your money back. Also if you sign up for a year then you can save 49% off their standard price because they give you 3-months entirely free. This is great to watch Rangers all season. Then simply follow the 6 simple steps from earlier in this guide and you can watch Rangers live on Rangers TV in the UK without issues.